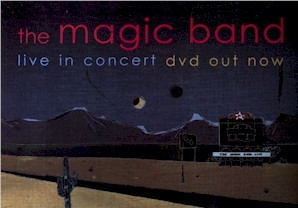 This show was available on the Magic Band’s Crow’s Milk DVD. Released in 2006 but now hard to find – second hand copies do turn up occasionally on amazon.co.uk. The film of the show was accompanied by the tour documentary entitled Crow’s Milk. Nearly twenty classic Beefheart compositions are rejuvenated on stage by five of the finest musicians who ever performed in The Magic Band. The playlist ranges from storming versions of crowd-pleasers such as ‘Moonlight On Vermont’ and ‘Big Eyed Beans From Venus’ to the intricate guitar work of ‘Evening Bell and the melodic ‘Alice In Blunderland’. Especially interesting are the instrumental versions of songs such as ‘I Wanna Find A Woman That’ll Hold My Big Toe Till I Have To Go’, ‘My Human Gets Me Blues’ and ‘Steal Softly Thru Snow’. Without Don’s voice, for Don is no longer performing, these compositions can be clearly heard as the mind and finger bending riddles they are. This film of the London Shepherds Bush Empire concert in April 2003 (80 minutes) was directed by Elaine Shepherd who also directed the BBC documentary ‘The Artist Formerly Known As Captain Beefheart‘.